If there’s a side-by-side that you could call the perfect starter double, Webley & Scott’s 700 is the gun. A basic boxlock built on the tried and trued Anson & Deeley action, 700s were made for decades. They’ve always been great guns, and if you’re looking for a solid, reliable English shotgun that’s on the affordable side, it’s a great choice. The one you see here, looks like it can be bought for $3,000 – a great price for a solid Birmingham boxlock in nearly-new condition. If this shotgun looks good to you, get on it now. The auction ends Wednesday, 6/12/2013 @ 12:07:43 PM ET. 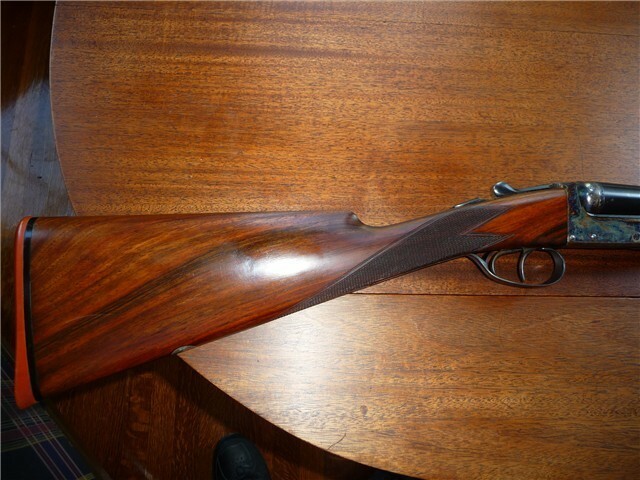 Webley & Scott 700 series 12ga 28″ barrels mod/full: in about 93% condition with a small area of freckling on right barrel. LOP is 15″ to front trigger w/ original Silvers pad. Case colors are strong.